Award-winning author Gail Pallotta’s a wife, mom, swimmer and bargain shopper who loves God, beach sunsets and getting together with friends and family. Gail’s a former regional writer of the year for American Christian Writers Association, a 2013 Grace Awards finalist and a 2017 Reader’s Favorite Book Award winner. She’s published five books, poems, short stories and two-hundred articles. Some of her articles appear in anthologies while two are in museums. To learn more about Gail and her books visit her website at http//gailpallotta.com. 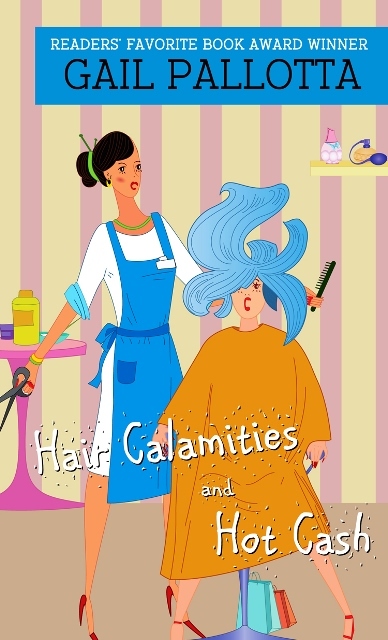 What happens when a New York stockbroker crashes his car into Eve Castleberry’s North Carolina beauty shop...on the same day the young widow’s defective hair products are causing wild hairdos? Soon Eve finds herself helping the handsome stranger hunt the thieves who stole his client’s cash...and hot on the trail of two of the F.B.I.’s most-wanted criminals! Romance blossoms amid danger, suspense and Eve’s hair-brained plan to get back the money. Buy the book on Amazon HERE. This is an easy recipe. If we want to have this dish for dinner on a day we’ll be out and about, I cook the sweet potatoes ahead and then warm them up and add the ingredients when we get home. Sometimes if we use small potatoes, we add a salad, but if the potatoes are large enough, it’s a meal for us. My husband named them Polynesian Sweet Potatoes because I put pineapple in them. Bake sweet potatoes at 325 degrees for three hours or until done. Cut in half and add butter, pineapple pieces and wilted spinach to taste. 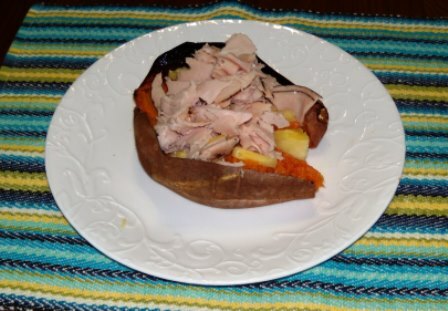 Bake turkey on low heat for five minutes or so, just to warm, and top the potatoes with turkey cut into bite-sized pieces. Sprinkle with cheese.